Congratulations to Poppy Ball for winning Improver of the month for February 2019. Well done! Congratulations to Freya Smith on winning Improver of the month for January 2019. Well Done! Congratulations to Anna Damerell on winning Improver of the month for December 2018. Well Done! Achievement Medals – Brooke, Jemma, Lauren, Ruby, Esther, Ella, Molly, Sophie, Ellie-Mai and Niall. Well Done to all the skaters! 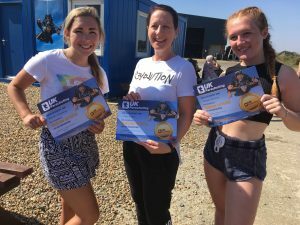 Congratulations to Carla, Brooke and Morgan, who each completed a tandem Sky Dive on 03rd August 2018. Raising money for the club and the Taylor High Memorial Fund. Well done ladies! Congratulations to Amber Morters on winning the improver of the month for April 2018. Well Done! Congratulations to Nancy Cooper winning the improver of the month for February 2018. Well Done! Congratulations to Jude Cooper winning the improver of the month for January 2018. Well Done! Congratulations to Jake and Felicity on their test passes – Jan 2018. Well Done! Congratulations to Charlie Youngman and Lucy Youngman winning the improver of the month for December 2017. Well Done! Congratulations to Ruby Baker winning the improver of the month for November 2017. Well Done! Congratulations to Freya Smith winning the improver of the month for October 2017. Well Done! Congratulations to Maisie Baker winning the improver of the month for September 2017. Well Done! Congratulations to Millie Utting winning the improver of the month for July 2017. Well Done! Congratulations to Jessica Hurren winning the improver of the month for June 2017. Well Done! Congratulations to Jessica Nichols winning the improver of the month for May 2017. Well Done! Congratulations to Jasmine Burden winning the improver of the month for April 2017. Well Done! Congratulations to Libby Glover winning the improver of the month for March 2017. Well Done! Congratulations to Daisy Hunt winning the improver of the month for February 2017. Well Done! Congratulations to Ellie Kilty winning the improver of the month for January 2017. Well Done! Congratulations to Ruby Golder winning the improver of the month for November 2016. Well Done! Congratulations to Skye Utting winning the improver of the month for October 2016. Well Done! Congratulations to Molly Crisp winning the improver of the month for September 2016. Well Done! Congratulations to Ellie-Mai Davey winning the improver of the month for August 2016. Well Done! Chloe Utting – Grade 8 Figures & Free, and Grade 9 Figures & Free Well Done Skaters! Congratulations to Jeanette Jones on winning Improver of the Month for June 2016. Well Done! Waveney Skaters won 4 Bronze medals won at the FARS Figure and Free British Championships in June 2016. Congratulations to the 6 Waveney skaters who entered. Well done to Brooke for taking 3rd place in her first year of Cadet Free skating, to Morgan for taking 3rd place in her first year in Cadet Figures and combined events and to Lilia for taking 3rd place in tots figures. Extra congratulations to Morgan for being selected for the Cup Of Europe in Bologna, Italy in November. This will be her 4th time representing Great Britain at this event. Well Done! Congratulations to Lewis and Libby Jones on winning Improver of the Month for March 2016. Well Done! ***NEW*** – Adult (Over 25s only) grade session Monday evenings 7.30-8.30pm at the Denes High School! Congratulations to Jessica Wegg on winning Improver of the Month for February 2016. Well Done! Congratulations to Nell Pelczaeska on winning Improver of the Month for January 2016. Well Done! Congratulations to Elle Darlow for winning Improver of the Month for November 2015. Well Done. Congratulations to Charlotte Saunders for winning Improver of the Month for October 2015. Well Done! Congratulations to Maisie Braddick for winning Improver of the Month for September 2015. Well Done! Brooke and Morgan have been selected to represent Waveney and Great Britain at the 2015 Cup Of Europe Competition in Dijon, France. This is an excellent achievement for both skaters. It will be Brookes first time representing Gt Britain at this event and Morgans third. The club wishes them both luck at the event in July. Congratulations to Rudi Chaplin for winning Improver of the Month for August 2015. Well Done! Congratulations to Redd Darlow for winning Improver of the Month for July 2015. Well Done! Congratulations to Katie Flanaghan for winning Improver of the Month for June 2015. Well Done! Congratulations to Ian Oxborough for winning Improver of the Month for May 2015. Well Done! It has been a pleasure to be able to host a training session with friends from Empress Roller Skating Club in Leicester. Waveneys president Barry Jiggins, Coaches Carla Smith and Carla Butcher along with Laura Pole, Janet Sturgess and Nigel Holmes, teamed up for a two-hour training session to prepare the skaters for the British Championships being held in Great Yarmouth and Andover. We wish all the skaters the best of luck. Congratulations to Emily Broad for winning Improver of the Month for April 2015. Well Done! Congratulations to Kalel Vaughan for winning Improver of the Month for March 2015. Well Done! Congratulations to Oakley Arnold for winning Improver of the Month for February 2015. Well Done! Congratulations to Zea Ibrahimu for winning Improver of the Month for January 2015. Well Done! Congratulations to Summer Meen for winning Improver of the Month for December. Well Done! Congratulations to Caitlin Thomson for winning Improver of the Month for November – Well Done! Congratulations to Sasha Meen for winning Improver of the Month for October – Well Done! Congratulations to Cory for winning Improver of the Month for September – Well Done! Congratulations to for winning Kavina for winning Improver of the Month for August – Well Done! Congratulations to Skye Pollard for winning Improver of the Month for July- Well Done! Congratulations to Michelle for being selected to represent Great Britain at the Hettange Dance Competition in France in October. Well done! Congratulations to Ellie-Mai Howe for winning Improver of the Month for June – Well Done! Congratulations to Amy Meadows, Maya Holmes, Charlotte Harker, Brooke Enticknap and Morgan Docwra who were all selected to skate at the Amphora Gala in Croatia. 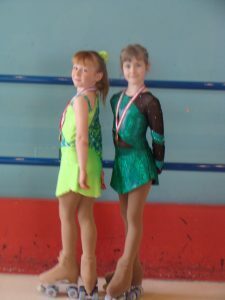 Only Amy and Morgan were able to accept their places, and both skated well for the club. Congratulations to Chenoa Lewis for winning Improver of the Month for May. Well Done! Congratulations to Corey for winning Improver of the Month for April. Well Done! Congratulations to Imogen Howlett for winning Improver of the Month for March. Well Done! Congratulations to Amelia Shaw for winning Improver of the Month for February. Well Done! Congratulations to Noah Cook for winning Improver of the Month for January. Well Done! Congratulations to Melissa Fawcett for winning Improver of the Month for December. Well Done! Congratulations to Leilani Long for winning Improver of the Month for November. Well Done! 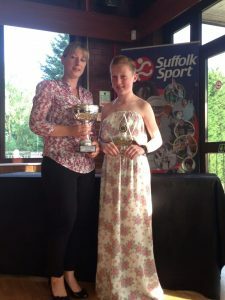 Congratulations to Morgan Docwra on being awarded the Waveney Sports Award for best Junior sportswoman 2013 for her achievements in skating so far – Well Done Morgan! Congratulations to Danelle Stevens for winning Improver of the Month for October. Well Done! Congratulations to Sophie Glover for winning Improver of the Month for September. Well Done! Congratulations to Evie Mirgoux for winning Improver of the Month for August. Well Done! Congratulations to Georgia Boyd for winning Improver of the Month for July. Well Done! Congratulations to Kele Smith for winning Improver of the Month for June. Well Done! Congratulations to Mia Davis for winning Improver of the Month for May. Well Done! Waveney Roller Skating Club is proud to announce that they have their first British Champion! Morgan skated a lovely clean programme to take the title in Peterborough on 11th May 2013. She was joined at the competition by Brooke who also skated well in the Mini Free event, taking 5th place.Both girls have been selected to skate in Misano, Italy in June.We are also pleased to announce that Charlotte, entered her first British Championships this weekend. She also skated a super programme, to take 3rd place in the Tots Free event 3 girls have earnt themselves a place in the British Free Skating Squad – well-done girls! Congratulations to Amelia Cousins for winning Improver of the Month for April. Well Done! Congratulations to Lilia Clarkson for winning Improver of the Month for March. Well Done! Our Annual AGM was held at the session on Wednesday 10th April 2013. £30 was raised in the Easter Raffle. Congratulations to Ben Moughton for winning Improver of the Month for February. Well Done! Congratulations to Phoebe Jenkins for winning Improver of the Month for January. Well Done! Congratulations to Cayla Horner for winning Improver of the Month for December. Well Done! Congratulations to Felicity Turner for winning the Improver of the month award for November – Well done! Congratulations to Jasmine Hallam for winning the Improver of the month award for October – Well done! Congratulations to Sophie Rushmere for winning the Improver of the month award for September – Well done! Congratulations to Millie Fountain for winning the Improver of the month award for August – Well done! Congratulations to Sophie Franks for winning the Improver of the month award for July – Well done! Congratulations to Chloe Utting for winning the Improver of the month award for June – Well done! Congratulations to Phoebe Searle for winning the Improver of the month award for May- Well done! Congratulations to Katherine Lincoln for winning the Improver of the month award for April- Well done! Congratulations to Morgan and Brooke for their selection to the International Gala in Croatia in June. Congratulations to Dakota Cockle for winning the Improver of the month award for March – Well done! Congratulations to Chloe Balls for winning the Improver of the month award for February – Well done! Congratulations to Ellie-Mai Aldred for winning the Improver of the month award for January – Well done! 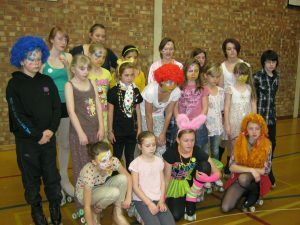 Waveney RSC raised £1374.11 for Children In Need in October 2011.Congratulations to all those who took part. Club coach, Carla Smith passed her International Judges test in December 2011. Carla is looking forward to joining the club’s other International judge, Victoria Brown at international competitions. 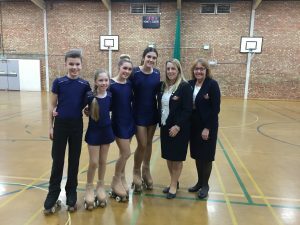 Fantastic results – Well done to all the skaters! Well done to all the winners and to all the skaters from the club. Good luck for 2012! Congratulations to Zoe Lowry for winning the ‘Improver of the Month’ certificate for December. Well done Zoe! Congratulations to Maisie Howlett for winning the ‘Improver of the Month’ certificate for November. Well done Maisie! Congratulations to Jessica Batista for winning the ‘Improver of the Month’ certificate for October. Well done Jessica! Congratulations to Morgan Docwra and Harley Streater on their selection for the Great Britain squad for the 2011/2012 season. A total of 6 medals were brought home. Well done! FOUR Medals at TOTS Championship!! 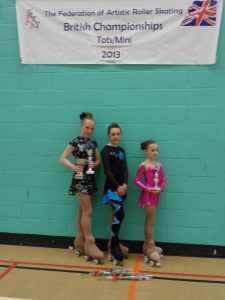 Morgan Docwra achieved four medals at the Tots championship for skaters up to 7 years old. She entered figure, free and solo dance achieving a medal in every event. Victoria Brown passed her Inter-gold solo dance test at Colchester on 22nd September. Last month Victoria Brown took her International judges examinations in Paris and passed all categories figures, free skating, dance, pairs, show and precision. Carla Smith is now a fully qualified judge for figures, free skating and dance. Active Waveney Sports Awards 2008/09. to roller skating over the last 55 years…..
‘Jane started roller skating at the age of seven and joined Great Yarmouth roller skating Club. She skated for Great Britain in two World Championships and has represented her country all over Europe. 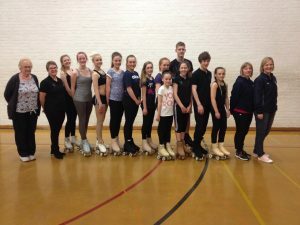 When the sports centre opened in Water Lane Lowestoft the Local skaters in the Waveney area asked Jane to teach not only the children but also the adults and this is how the Waveney Roller Skating Club started. Jane had been Professional Coach to the Great Yarmouth Club so was looking forward to coaching at Waveney. 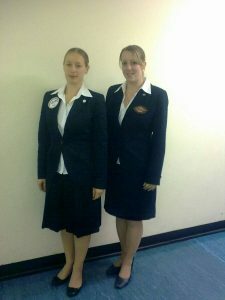 Congratulations Michelle and Victoria for selection for Pieris International Solo Dance Competition May 2009 – Good Luck! Congratulations to Victoria, Carla & Lucy who successfully passed their tests on the 15th Feb.
Congratulations to all skaters who took their tests on the 31st Jan. Copyright © 2018 Waveney Roller Skating Club All rights reserved.